As a Raleigh family photographer, I have the honor to take a variety of special events and milestones for families. From birthdays, anniversaries, to annual family portraits, it keeps my job fun and interesting! 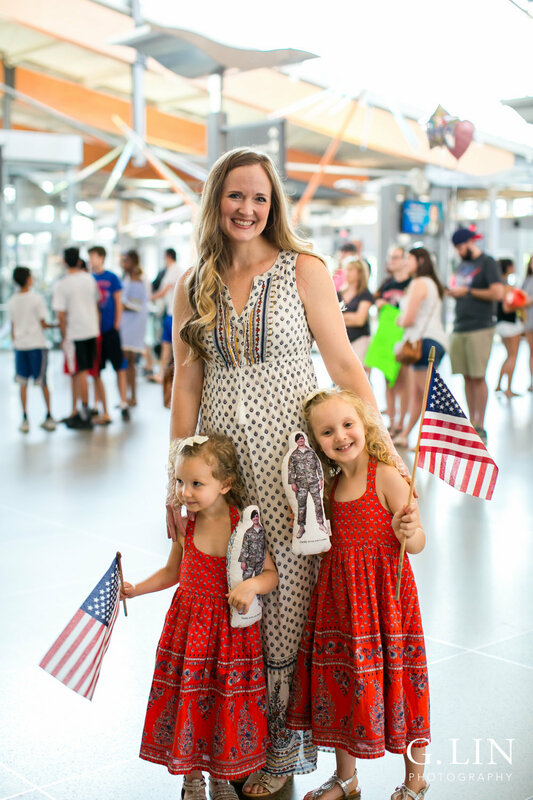 For this particular Raleigh family photography session, I had the honor to document a very special homecoming for the Bryant family at RDU Airport. This was a special homecoming because Wes was coming home from his last deployment with the Air Force, and Katie wanted to capture this once-in-a-lifetime moment for them to remember! The Bryant's are a darling family with two precious little girls. When I met them at the airport, I was greeted by their warm smiles! The little girls wore beautiful matching red dresses, cute bows in their hair, and were carrying the American flag. It was very patriotic and ADORABLE all at the same time!! :)What I loved most were the dolls they were holding. If you look closely, it is a doll of their dad, which says, "Daddy loves you..." with their daughter's name. I felt like I was ready to cry because it was so sweet and touching! They would be able to give their dad doll a squeeze if they were missing him while he was away! Also, it was wonderful seeing the USO present at the homecoming. There were many other families arriving home that day, and it was truly a beautiful moment. Thank you, Wes, and to all the men and women who serve our country!